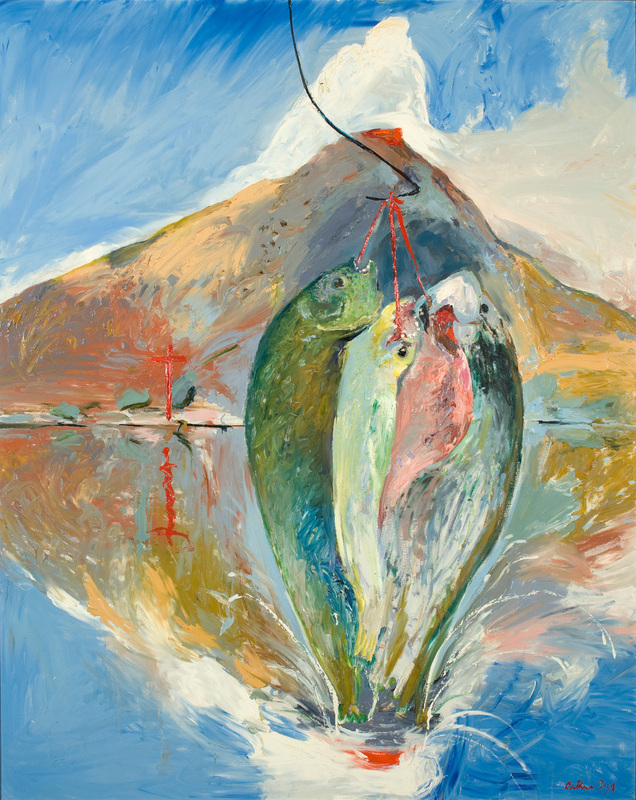 Arthur Boyd: Landscape of the Soul Curated by Barry Pearce. National Art School, 10 January – 9 March 2019. Rochford Street Review caught Barry Pearce’s curatorial introduction to the premier showing at the National Art School of the travelling exhibition Arthur Boyd: Landscape of the Soul which he has curated for the Bundanon Trust. An intimate survey of Boyd’s journey as an artist, the show will travel from 8 June 2019 through to September 2021 to regional galleries before returning to Bundanon. It is hoped it will return to a new purpose-built gallery which is to be constructed at the 1,100 hectare property that Yvonne and Arthur Boyd gifted to the Australian people in 1993. Twenty six years on from this generous bequest, Bundanon continues to operate as a centre for creative arts, education, scientific and environmental research and artist residencies. Emeritus Curator of Australian Art at AGNSW, Pearce, began his talk playfully remarking “Don McLean nails it for Arthur Boyd” – a tongue in cheek reference to The Starry Night by Vincent Van Gogh foregrounding that whilst still an adolescent Boyd was channelling the same spirit of the master, striving to create luminosity and light in paint as evidenced in the Pastoral landscape,1936. Lightness was interspersed with both painterly and spiritual darkness throughout Boyd’s creative life, and he readily mastered the painterly techniques required to move from major to minor keys, as his imagination was triggered by the mythology he had heart discussed in his parents salon, and the classical albums he loved to play whilst painting. As a young man, tone and light continued be abiding preoccupations, along with mythical figures and biblical scenes which figure in masterworks such as Nebuchadnezzar series and The Expulsion. Red Nebuchadnezzar fallen in a forest with lion, 1968-69, oil on canvas. Pearce curated the 1993 Art Gallery of NSW’s retrospective of Arthur Boyd’s astonishingly extensive oeuvre. By that time, thousands upon thousands of works had been created, and Boyd kept suggesting more works to be included. In 1992, Pearce eventually explained to the artist that an exhibition was rather like a suitcase – only so much could be packed into if it were to work! If the 1993 show was, to use a musical analogy, an orchestrated complexity, the current exhibition was more like a chamber concert. And central to that sense of intimacy, the works chosen are exemplars of the major concerns of one of Australia’s most revered landscape artists. The passion, speed and sheer volume of Boyd’s paintings – many shrouded in darkness and focusing on mythic figures – may have been a kind of self-therapy to erase or “unsee” images which had troubled him since childhood. Boyd grew up in a family of prodigious artistic talent — his grandparents were accomplished painters, his uncle a celebrated author but his father, Merric, although a well-respected potter, suffered debilitating epileptic seizures in a time when the condition was little understood, barely managed and probably demonised. Despite his unparalleled knowledge of Boyd’s work, Landscape of the Soul proved to be something of a revelation for Pearce who worked with the Bundanon Trust curators and conservators. As conservation drawers containing works were opened, he discovered treasures from Boyd’s youth that the artist had kept, but never shown him. These overlooked works yielded the impetus for Pearce’s exploration of the artistic lineage and the turning points in Boyd’s career. 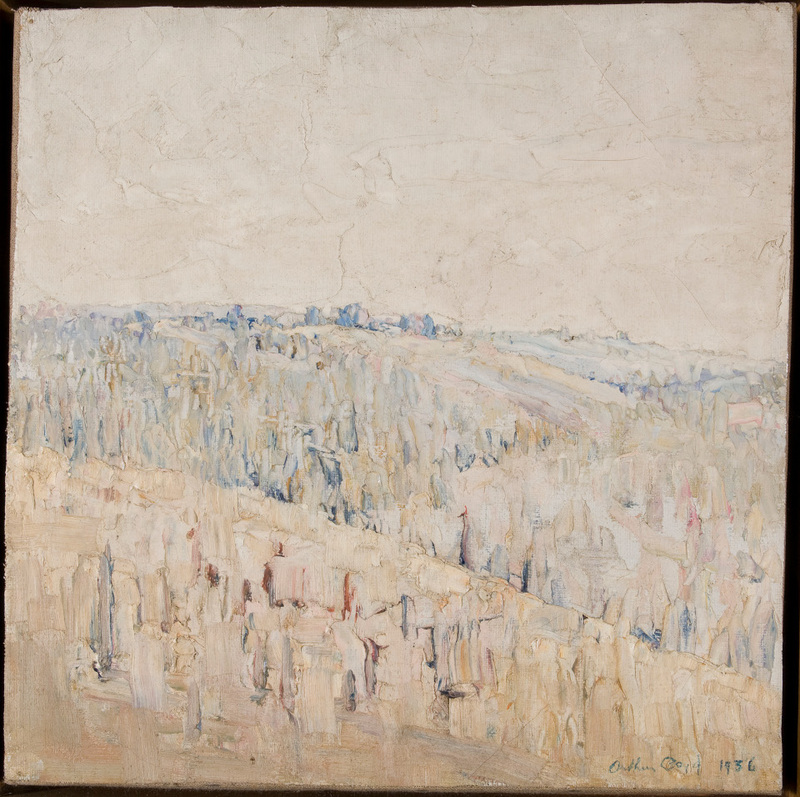 Pearce also foregrounds the little known work of Doris Boyd, Arthur’s beloved mother, whose artistic drive was perhaps sublimated into her five children as she juggled her household, whilst supporting a husband with major health issues and managing the family’s pottery business at Open Country. It was beautiful to see these important works in the NAS Gallery space and intriguing to consider them in the context of the tale of Boyd’s journey to live with, and through, his art,which has been articulated by a personal and venerating friend, who understood well the residual traumas that plagued the artist. The result is part memoir by a personal friend and part incisive assessment of the work by an expert art curator who understands the influences and techniques that Boyd conjured with. This humanistic, common sense tone is fair enough given Arthur Boyd was born in 1920, when the meta-narratives of Modernism were in their ascendancy. The story Pearce tells embraces a lineal progression of the artist as an individual subject expressing and integrating the inner conflicts and joys of his life via the medium of painting. For this reviewer, the four sections used to convey the theme and sub-themes of the exhibition recall the classic essay structure of introduction/ thesis/antithesis/synthesis. Certainly, there is little problematising of the relationship between the writer and his subject. And so, whilst Boyd passed away in 1999, his spirit is foregrounded in this concise exhibition. It is almost as if the artist and curator (author) are two actors conversing in this exhibition’s (tale) until a third protagonist appears saviour-like in the last act and that saviour is the genius loci of Bundanon on the Shoalhaven River; a landscape made iconic and hauntingly familiar to many Australians by way of the Shoalhaven series. 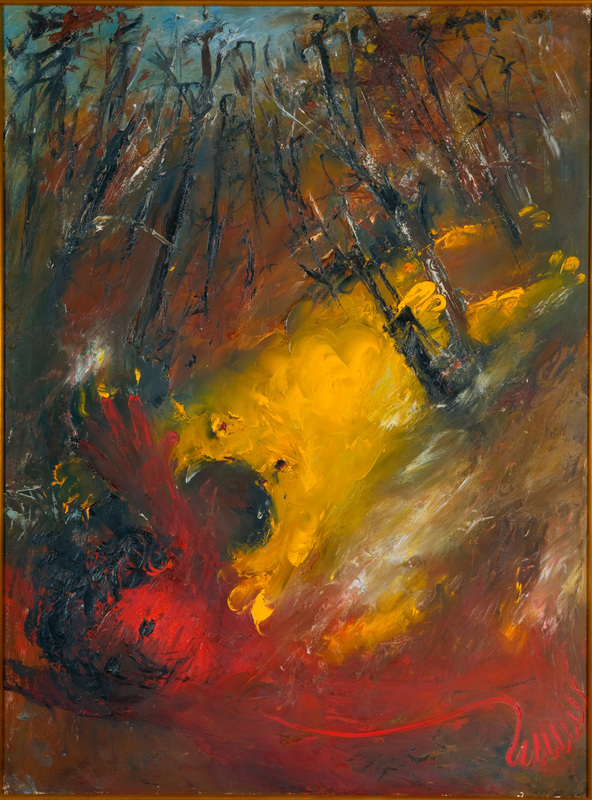 According to Pearce, Boyd attained peace at the healing place of Bundanon, returning to plein air landscape and the luminous light which he excelled at rendering, and consolidating the tonal virtuosity he had precociously demonstrated as an innocent boy. At Bundanon, Boyd recalibrated after living in Britain where he had taken in the wealth of art and music available but had also wrestled for more than a decade with dark imagery and tragic archetypes following the death of Merric in 1959. To Pearce, the final act was a time of integrating these innermost struggles and shadowy elements with the artistry of capturing light that had inspired him since his boyhood. Interestingly, we were told, the artist wrote the cryptic words “I am held” on the back of each work he painted. The answer however as to who — or what — held Boyd is something that not even Barry Pearce has dared answer despite its insights into his psyche. Linda Adair is a Blue Mountains-based writer and critic and one half of Rochford Press.